My family was visiting from Boston and San Diego a few weeks ago, thumb and I loved showing them around my adopted city. I made sure they covered all the classics: Cape Point, visit this site Waterfront, geriatrician Bo-Kaap, Bon Jovi… (What? They were playing, and I didn’t want the family to feel homesick!) 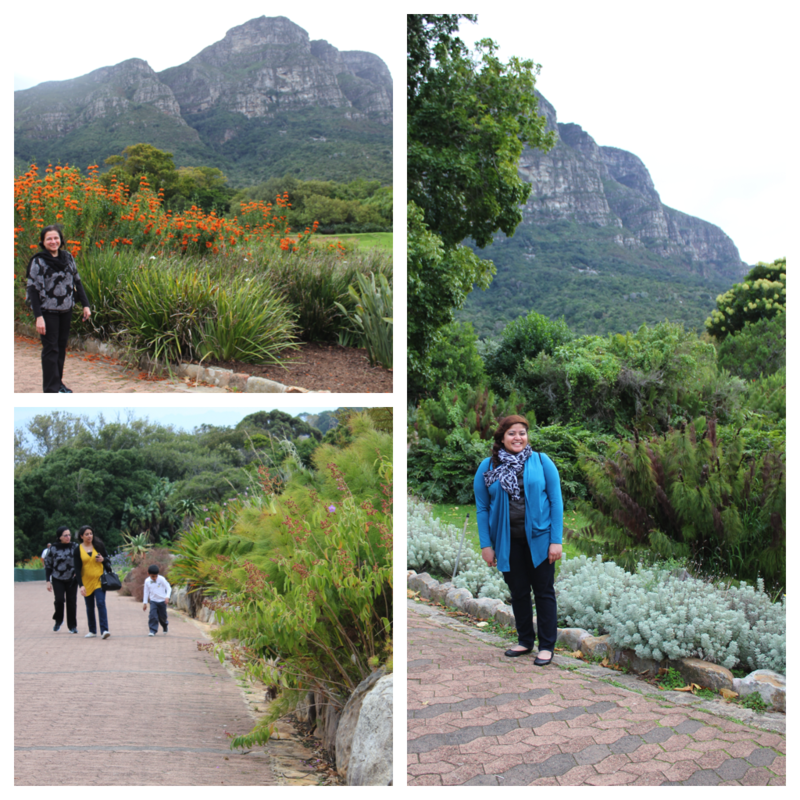 And while Kirstenbosch National Botanical Gardens is undoubtedly a classic, it doesn’t always make it to every traveler’s whirlwind three- to four-day Cape Town itinerary. 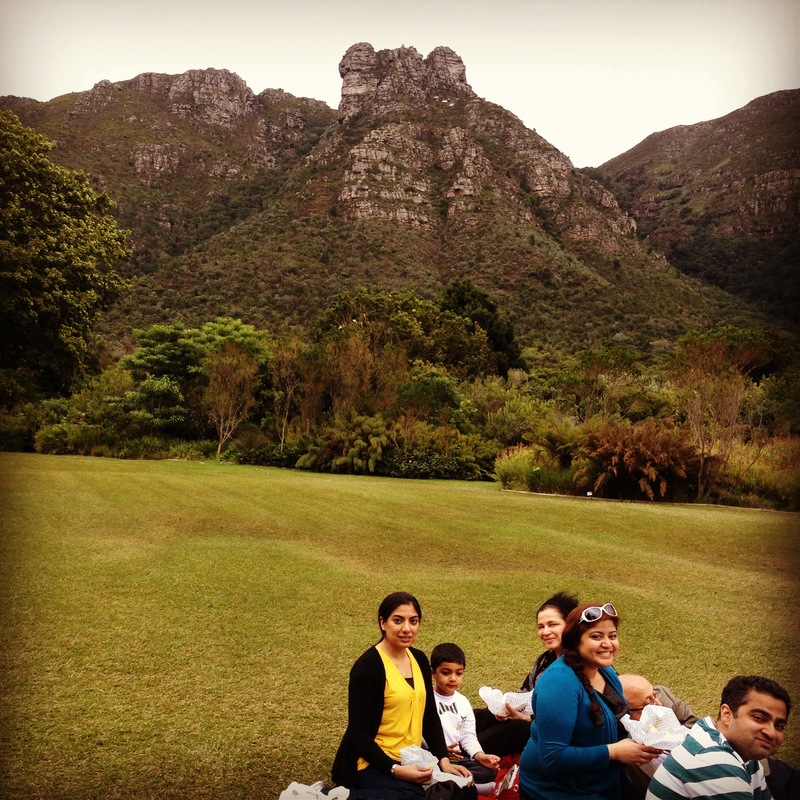 But when you live exactly five minutes from one of National Geographic’s top 10 picnic spots in the world, you make sure you take your visitors there to test the legitimacy of that title. 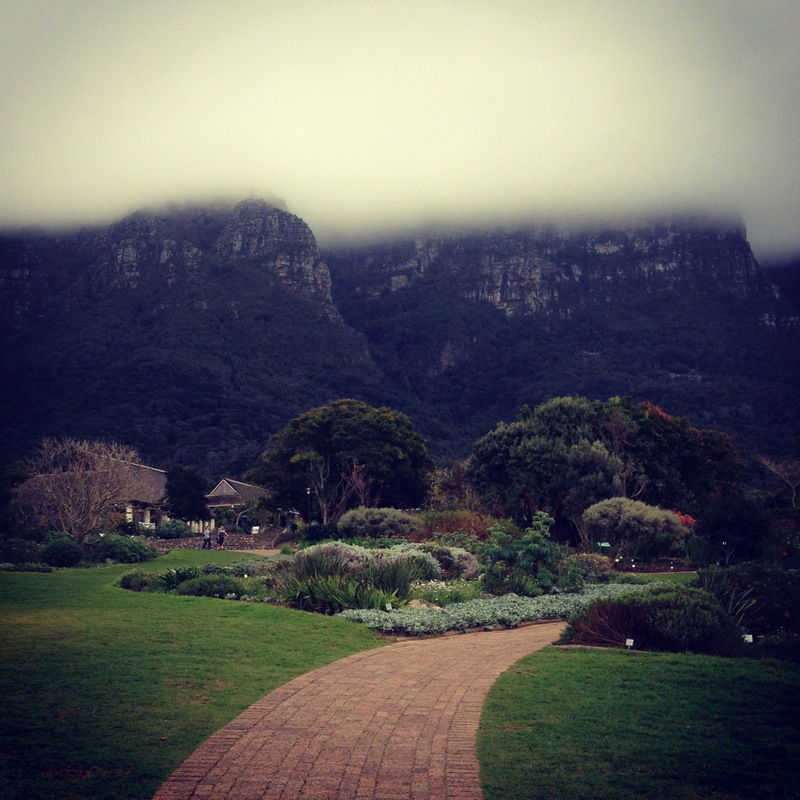 In a city of myriad scenic delights, Kirstenbosch still manages to stand out. Set at the foot of Table Mountain, the garden spans 90 acres and hosts a staggering 7,000 indigenous species — but that’s not that surprising when you consider that Table Mountain alone boasts more species of flora and fauna than exist in all of the United Kingdom. It’s in the midst of celebrating its centenary this year with a series of walks, talks, and other special events. The fam had a great time roaming the pathways and taking in the scenery — even on a cloudy day that ended in a bit of drizzle, the setting still sparkled. After meandering about leisurely, we realized that while the clouds were pretty in theory, they didn’t bode well for our picnicking aspirations, so we set up our blankets and provisions near a small pond. Yes, that’s Dad doing all the work, and me on the right, directing the setup. Classic family dynamics will persist in any hemisphere. So how did our picnic go? Overall, not bad. Lovely setting, lovely family bonding. Two issues sent us off to a hasty retreat to the park’s mammoth (and covered) Botanical Society Conservatory, though: the drizzle that started late in our lunch, and… a flock of wild guinea hens that surrounded our site. My sister was convinced they were out to massacre us. Lesson learned: When searching for the perfect picnic location, do not pick a spot directly on a bird’s route to water. 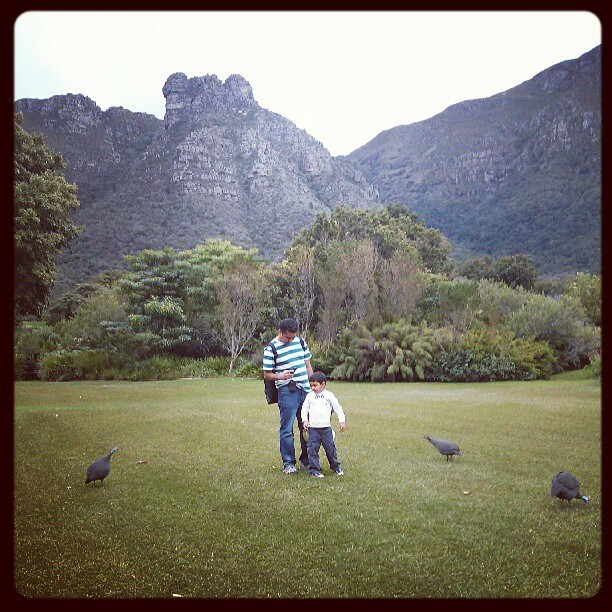 Kirstenbosch also hosts live concerts and open-air movies during the summer months (October–April). 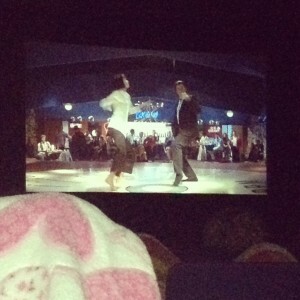 Since I moved here in the middle of April, I was able to catch the last movie screening of the season: Pulp Fiction. Apologies for the terrible picture, but I couldn’t resist capturing one of cinema’s iconic moments on my phone! I’m already looking forward to next summer so I can make the most of being neighbors with this gem. 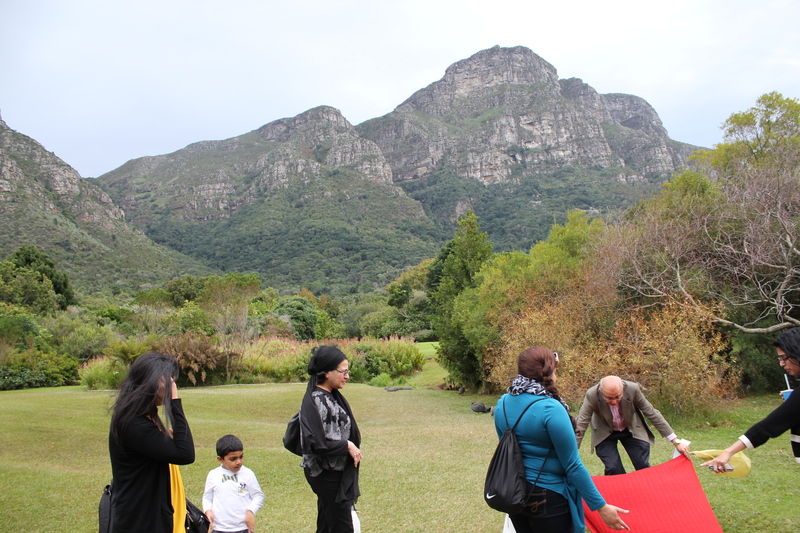 Happy 100th birthday, Kirstenbosch!